The UK Biobanking Showcase, organised by the UKCRC Tissue Directory and Coordination Centre (BBMRI.uk), is the UK’s annual event covering the latest developments in biobanking. Held at the Kia Oval cricket ground in London, the Showcase attracted more than 140 people from across the UK working in biobanks, research, industry and the government. This year’s showcase sought to highlight some of the recent discussions and developments in biobanking including recognition, standards, collaborations and changes impacting the interface with the public. As with the previous year, the delegates also had the opportunity to debate some controversial topics like, ‘researchers should be able to leave reviews about the resources they have accessed on the [Tissue Directory]’. Overall, the aim was to present practical information on the future possibilities of biobanking to support the ongoing work in the field. 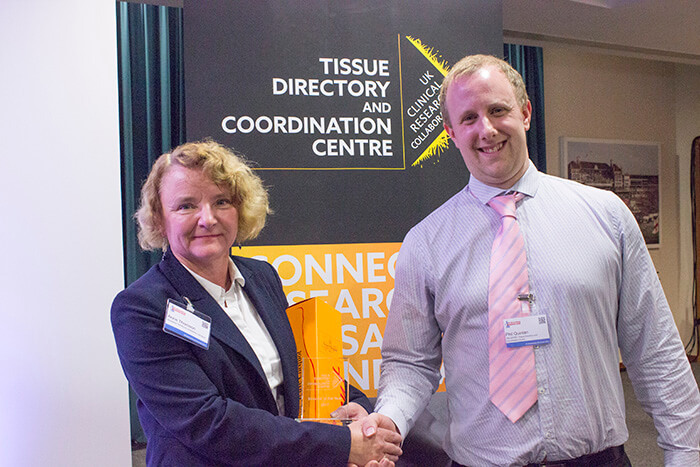 Photo: Dr Phil Quinlan, Director UKCRC Tissue Directory and Coordination Centre (right) with Anne Thomson from Bloodwise Childhood Leukaemia Cell Bank, the 2017 Biobank of the Year Award Winner (left).